Meghalaya MBBS and BDS state quota seats are being filled through state NEET Counselling 2018. 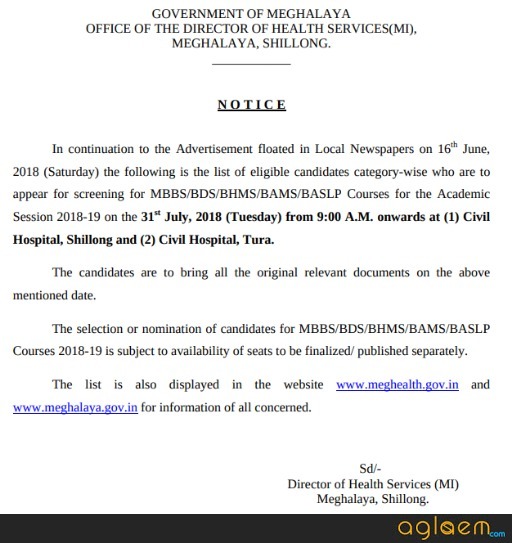 Meghalaya has released notification for admission in MBBS and BDS against state quota for academic year 2018-19. Candidates who has appeared in National Eligibility Entrance Test and wish to get admission in state seats must submit application form as per schedule. Authorities will make use of state merit list and preferences of applicants to allot seats. 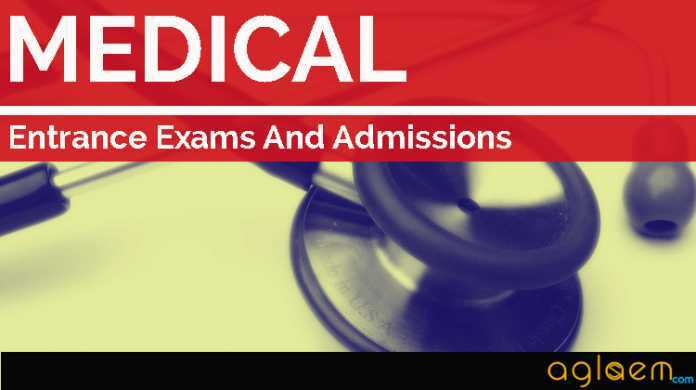 Requisite Meghalaya MBBS/BDS Admission 2018 fee has to be paid at time of admission. Latest: List of selected candidates for MBBS/BDS/BASLP study in respect of the seats allotted to the State of Meghalaya during the academic session 2018-19 has been released. 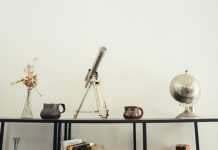 Scroll down to check. Guidelines for admission must be adhered to by applicants. Announcement for selected candidates list will also be available online at official websites. Applicants whose names are included in the list selected for the nomination and published as above are required to report to the Under Secretary to the Govt. of Meghalaya, Health & Family Welfare Department, Room No. 506, Additional Secretariat Building within the date and time to be indicated while publishing the list of selected candidates and personally submit their letter of acceptance, execute Surety Bond for the value of Rs. 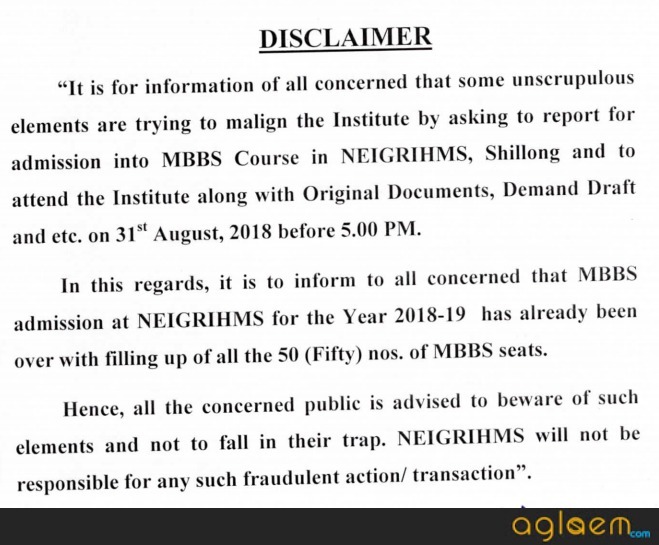 30,00,000/- (Rupees Thirty Lakhs) only (in case of MBBS Course) with 5 (five) years rural service and to collect their letter of nominations for further instructions, as the case may be. Any selected applicant, who fails to report according to the fixed date as specified above, will automatically lose his or her right to nomination and the next eligible candidate from the waiting list will be nominated. Terms and conditions for admission and all other requirements including recurring fees of the concerned medical institution to which the applicant is nominated will have to be abided and paid by applicant concerned in time and responsibility on this count shall rest with candidate. Seat Allotment: Click here to check list of selected candidates for MBBS/BDS/BASLP study in respect of the seats allotted to the State of Meghalaya during the academic session 2018-19. Candidates must be indigenous inhabitants or permanent residents of state and have passed 10+2 from a recognized university, board of authority in subjects of Physics, Chemistry, Biology/Biotechnology, English. Also, candidate should have qualified NEET UG 2018. The children of employees of Central Government, All India Services, other state/UT government posted in and having headquarter within Meghalaya will also be eligible to apply, provided (1 and 2) is fulfilled above. Minimum 17 years and Maximum 25 years as on 31 December of year of admission. Upper age limit is relaxed by 5 years for SC / ST / OBC. 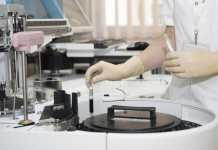 Meghalaya had invited applications against state quota seats in medical institutions. Office of the Director of Health Services (MI), Shillong and District Medical and Health Officer, West Garo Hills District, Tura had received the application form. Application Form was obtained from the office of the Director of Health Services (MI), Meghalaya, Shillong and the District Medical and Health Officer, West Garo Hills, Tura against Demand Draft (Nationalised Bank ), of Rs 250 (or Rs 100 in case of ST/SC) payable to Director of Health Services (MI), Meghalaya, Shillong. Application Form: Application Process is over. Completed application forms was only accepted in the office of the Director of Health Services (MI), at Shillong and District Medical and Health Officer, West Garo Hills, Tura. Candidates must note that after submission of the Application Form it cannot be withdrawn. Claims for refund of application fee was not be entertained. Application Form without NEET UG 2018 Result Sheet was not considered under any circumstances including postal delay. Eligible applicants will require to appear before a screening committee for verification of original copies of 10 and 10+2 level, NEET UG 2018 (result sheet) admit cards, mark sheets, ST/SC certificate, permanent residential certificate (PRC), character certificate from institution last attended and certificate of having passed qualifying examination in science stream at time of appearing interview of screening. All original certificates should be available. For more details on Meghalaya MBBS/BDS Admission 2018 , download admission notification. MBBS BANGLADESH is the best option for Indian non ranked medical aspirants, who are finding secure medical seats in abroad. Bangladesh colleges are nearest oldest and cheapest compare to other abroad options.